Mrs. Kellogg was born in Fremont on October 6, 1927 to Amos and Margaret (Moran) Gnepper. 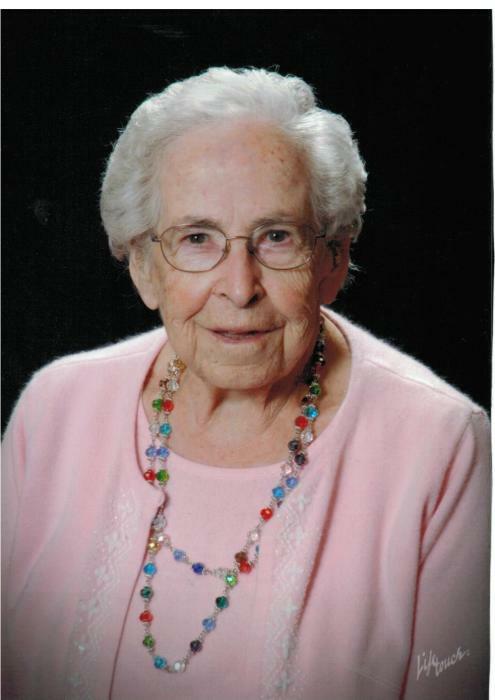 She was a member of the 1946 graduating class of Clyde High School. Roberta retried from Eaton Controls in Fremont in 1992. She enjoyed traveling, fishing, reading books, needle point and cross-stitch. Mrs. Kellogg was a member of the First Presbyterian Church, Clyde. She had been active in several areas of the church while her health permitted it. Surviving are three children, Thomas ( Chris) Kellogg of Port Clinton; Virginia Kellogg of Genoa and Paul (Vanessa) Kellogg of Genoa. Four grandchildren, Stacy (Kevin) Thomas; April (Steve) Reeves; Aaron Amanda Kellogg and Amanda (Ryan) Mooney, along with seven great grandchildren also survive. One sister, Esther Hartley of Virginia also survives. Roberta was preceded in death by her parents, twin brother, Robert Gnepper; brothers, James Gnepper, Charles Gnepper and Gerald Gnepper, sisters, Nina Fleming, Mildred Mesnard and Kathleen Giffen. Visitation will be on Friday, February 1, 2019 from 10:00 am until the service at 11:00 am at Mitchell-Auxter Funeral Home, 218 South Main St., Clyde, Ohio. pastor Rose Jones will officiate with burial in McPherson Cemetery. Memorials may be made to First Presbyterian Church, Clyde.